….Thus has Peter Wallison, a resident scholar at the American Enterprise Institute, and a former member of the Financial Crisis Inquiry Commission, almost single-handedly created the myth that Fannie Mae and Freddie Mac caused the financial crisis….Allies? Start with Congressional Republicans, who have vowed to eliminate Fannie and Freddie — because, after all, they caused the crisis! Throw in The Wall Street Journal’s editorial page, which, on Wednesday, published one of Wallison’s many articles repeating the Big Lie. It was followed on Thursday by an editorial in The Journal making essentially the same point. Repetition is all-important to spreading a Big Lie. were doing it to compete with their private sector rivals, not because Congress or anyone else was forcing them to. How brazen is this? Just look at the chart on the right. In 2002, Wall Street banks start the subprime bubble. That same year, Fannie and Freddie see their market share start to plummet. 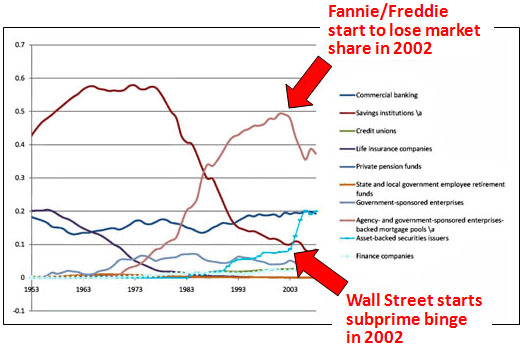 It’s not until 2005, at the tail end of the bubble, that Fannie and Freddie get back into the game. Fannie and Freddie were bad actors in a lot of ways, and that makes them an easy target for conservatives who are desperate to absolve the private sector of any blame for the financial crisis. But when it comes to assigning blame for the housing bubble, the evidence against them is laughably thin. Like it or not, this was Wall Street’s fault.